Hi folks, just getting used to me new to me B331. One red is for house, the other marked starting.......what is the "Negative Common" black switch for? Assuming it's still in the factory configuration that switch is a cutoff for all the ground lines before they go back to the battery. Some owners re-wire that to re-purpose the switch as an emergency cross-over between the batteries. So what would be the use for it? The Black is the 12vdc negative lockout. When you have a deep kimchee electrical situation you snap off the red positive switch and then the Black negative, in that exact order. The concept is that you take your batteries out of the fuss. Eliminates any unknown parasitic 12vdc loads if you are wired accordingly, but many DIY guys wire to ground around the switch, so you have to know your system. Nothing wrong with the switch system. The best reason I have heard for the ground switch is to prevent someone in the cockpit hitting the start button while someone is working on the engine. Me, I replaced & rewired that black swich with a red one to accomodate a third battery. Great system! If your vessel is wired like many Bene's you don't likely have "HOUSE" and "START" you simply have two battery banks that are in parallel when both switches are set to ON. Leave both switches set to ON, and discharge too far, and you're dead in the water. I have a number of Bene & Jenneau customers who've learned this the hard way.. Unfortunately many, but not all Beneteau's, have a bussed switch system where by HOUSE and START switches are permanently bussed together on the load side of the switches. Any time both red switches are turned ON both battery banks are in parallel. Many owners are unaware of this wiring scenario and incorrectly assume they have "isolated" HOUSE & START banks.. If your boat has this wiring it is best to correct this issue. Leakie Marine and jssailem like this. The charts are truly great, thanks Maine Sail! I've not liked the wiring in my Bene 321 ever since we got her. I'm confused, thought: in the upgrade image, what's the hexagon lead, labeled "ALT"? ALT is the output of your alternator, wired to charge your house bank. Thanks David, but I'm nevertheless confused. The drawing shows the negative lead going to negative busbar; positive to one side of ACR, and to where the starter battery lives; and "ALT" to the other side of the ACR, and where the house battery bank lives. So ALT needs to be positive; however, part of this design is to avoid a shunt between the two battery banks, so ALT can't be just another name for Positive. Any ideas? An automatic charging relay (ACR) is not a “shunt”. I found something interesting -- this is the wiring on the 2005 Beneteau 343. I dont have a windlass, so that 90A breaker in Circuit E does not exist. 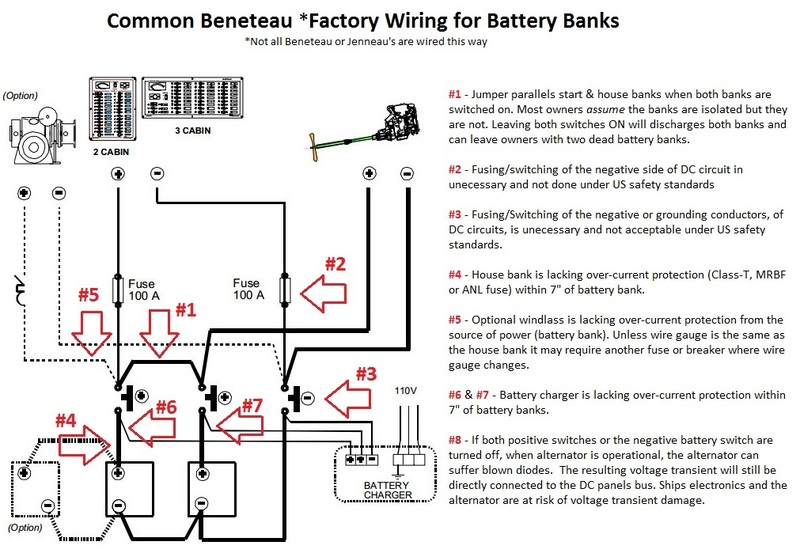 The schematic appears to deviate from your post on "Common Beneteau Wiring" in that there is no FIXED jumper between house and starting battery banks. The parallel connection is made, but via a parallel switch marked "Albright SW80-68". I believe this switch is designed to parallel the batteries ONLY if senses output voltage from the ALT, in order to charge the house batteries. If I am wrong, and they are paralleled anytime both positive switches are on, then I am at risk of exhausting both battery banks, which I want to avoid. In this case (unless I want to rewire the neg batt switch to emergency parallel as you indicate), can I just replace that albright parallel switch with an ACR and be done with it? You are correct. The banks are not paralled (normally) except when the alternator is running to charge both banks. Proof is that engine will not start when house bank switch is on and starter bank switch is off. I purchased another red switch that I intend to wire a jumper to enable both banks to be combined, if starter bank discharges & has insufficient power to start the engine. The “emergency” switch would normally remain in the off position. The ACR would work; however, you still need a jumper and switch to enable the banks to be combined for emergency use. So....the ACR is really unnecessary in my opinion. I purchased another red switch that I intend to wire a jumper to enable both banks to be combined, if starter bank discharges & has insufficient power to start the engine. The “emergency” switch would normally remain in the off position. That is a recipe for disaster: combining a good bank with a bad bank. What you should design and install is a way to keep the banks isolated from each other (except when charging, via a switch or an ACR) and have a way to SWITCH from one bank to another. Like MS's diagram. This "combine" is getting really repetitive in getting folks to understand why it is a bad idea. Forget for a moment the well deserved rant about the BS DCP switch. Focus on the "combine" as only one of two options "feature" as a faulty design for sailboats. He DOES discuss how it works well for runabouts. The key is that when installing the additional switch and jumpers, it must be downstream of the existing switches. That way you can use the emergency switch to either combine the banks, or to cross-over between them. For example, to start the engine from the house bank first turn off the engine bank switch, then turn on the emergency switch, and it will divert from the house bank to the starter. The banks are ALREADY isolated, except when charging. 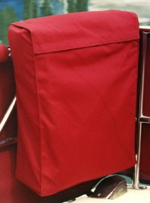 The additional red/positive manual switch would permit combining the banks or switching banks ONLY in the event that the starter bank had insufficient power to start the engine. This is essentially what Mainsail has advocated. And yes, this concept has repeatedly been discussed with individuals repurposing the negative black switch to combine the banks. I prefer to keep the negative switch wired as Beneteau originally wired to completely shutdown the DC system if necessary. I added a third battery and replaced the black switch with a red. I also placed/replaced the battery & Victron & solar in one project. IIRC, Doug M's 2005 B323 is wired different than my 2006 model, 3YM20. You can't say there is a "Standard" Beneteau wiring plan. Now, each battery and charger lead is wired to the bottom of it's own switch. OEM was a heavy cable strap between the two red switches. Now, I have the top lug of the 3 red switches are strapped together, so in effect is creating a +12-volt buss. Windlass/Inverter/starter/Alt/ckt brkr pnl are wired off this buss. The T1 voltmeter wire is wired to this buss, so switchong any battery on can provide a read. One of these day's I'll get a 3-position volt meter. Wiring schematic available upon request. Turn on any 1 or 2 or 3 batteries as you need. In the slip or anchored overnight I have 2 batts on, one in reserve. There is no "house" or "engine" battery. I added a third battery and replaced the black switch with a red. Wiring schematic available upon request. Ron, also would be very interested in seeing how you did your solar panel and wiring with the Victron. Another project I want to do!